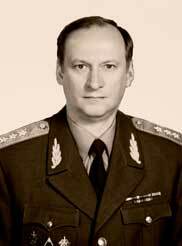 Director --- PATRUSHEV, Nikolay Platonovich, Gen Army, appointed in Aug 99 (Profil, 30 Aug 99). Promoted to Gen Army (Interfax, 11 Jul 01). Moscow, 101000, Lubyanskaya St., no. 2; Telephone: 924-31-58 (reception), 914-39-08 (press service) (RIA Novosti, 27 Jun 02). PUTIN, Vladimir was appointed 25 Jul 98 (RIA-Novosti, 1330 GMT 15 Sep 98). KOVALEV, Nikolay, Gen Army, was appointed 9 Jul 96 (Moskovskiy Komsomolets, 10 Jul 96 p 1). Promoted to Col-Gen in 1996, (Rossiyskiye Vesti, 10 Jul 96 p 1). BIOGRAPHICAL INFORMATION: Born in 1949. Began working in the security service in 1974. �...the relationship between Barsukov and Kovalev began long before the Kremlin garrison commander joined the counterintelligence service. ...in December 1994, after Yevgeniy Savostyanov was dismissed from the position of chief of the FSK [Federal Counterintelligence Service] Moscow Directorate ...[Most-bank incident] ...Kovalev was invited to head the Moscow directorate. ...at the time the Moscow branch was temporarily headed by Main Protection Directorate Chief Mikhail Barsukov. ...For many years Kovalev worked in the ideological counterintelligence and political surveillance department. He monitored dissidents and malcontents" (Moskovskiy Komsomolets, 10 Jul 96 p 1). �Nikolay Kovalev, a 47-year-old colonel general, has become the seventh director of the FSB since 1991. He joined the KGB in 1974 as an ordinary operative. For two years he served in Afghanistan. After that he worked at the Moscow and Moscow Region Directorate of the Federal Counterintelligence Service. From 20 June this year he has been the acting director of the FSB. On Lubyanka, he is described as a very cautious man. He always calculates the possible consequences of any decisions. People who know him say that at work he will not set the Thames on fire. Nevertheless, some major FSB operations in which Kovalev has been involved have been highly successful. He was one of the people in charge of the investigation into a large-scale swindle involving a million counterfeit dollars which the Italian mafiosi were trying to smuggle into Russia. In 1994, he was placed in charge of the Moscow directorate. Nikolay Kovalev does not like to be at the center of attention, and he treats the media with caution. Some of his colleagues at work describe him as a calm man, one of those who in any company immediately wins people over. He occupies a very tough stance toward crime� (NTV, 1800 GMT 9 Jul 96). Promoted to General of the Army (RIA-Novosti, 1549 GMT 23 Feb 98). BARSUKOV, Mikhail Ivanych was appointed in Jul 95 (http://www.gov.ru/main/ministry/isp-vlast47.html). Promoted to General of the Army (Chelyabinskiy Rabochiy, 16 Nov 95 p 2). STEPASHIN, Sergey Vadimovich, Lt-Gen, was appointed in Feb 94 (http://www.gov.ru/main/ministry/isp-vlast47.html). Deputy Director, Chief of the Economic Counterintelligence Department --- ZAOSTROVTSEV, Yuriy (Nezavisimaya Gazeta, 6 Mar 02), (Nezivisimaya Gazeta, 29 Nov 01). "Yuriy Yevgenyevich Zaostrovtsev war born in 1956 in the family of a KGB staffer. He is a graduate (some people say) of the Leningrad KGB School. He served in the FSB Economic Counterintelligence Directorate -- he was in charge of the State Customs Committee. In 1993 he was discharged from the organs with the rank of colonel and the post of chief of a sector of the UBKK (Directorate for Combating Smuggling and Corruption). He received a leadership post in the Tveruniversalbank where he headed the security and protection service. In early 1996 he transferred to the Medoks firm, which is part of the Sibirskiy Alyuminiy group. In November 1998 he was reinstated in the FSB and sent to the Economic Counterintelligence Directorate, while remaining on the staff of the Presidential Staff, where in July 1998 he had been given the post of assistant to Nikolay Patrushev (then head of the Main Control Administration) and chief of a Main Control Administration section with the rank of state counselor, 1st class. He later became head of the FSB Directorate for Counterintelligence Support to the Financial and Banking Sphere. Now, with the rank of deputy director of the FSB, he is head of the economic counterintelligence department. He planned and conducted the operation against Gusinskiy and Media-MOST" (Nezavisimaya Gazeta, 29 Nov 01). ". . .considered one of the people closest to the president [Putin]. Zaostrovtsev is presently one of the central figures of the PR-campaign to 'wheedle' the president's closest circle. They present him, in particular, as the 'economic brain of the team of Petersburg Chekists' and as a candidate to head the FSB or one of the departments of the government's economic bloc." (Moskovskaya Pravda, 29 Nov 01). Deputy Director, State Secretary --- SHULTS, Vladimir, Lt-Gen, appointed 12 Jul 02 (ITAR-TASS, 25 Jul 00). Shults, 52, was born in Nizhny Tagil, Sverdlovsk region. His work record began as a worker with Sverdlovsk's construction trust in 1966. He graduated from the Leningrad State University in 1972 and finished a postgraduate study at the university in 1980. Shults worked as lecturer in the Political College of the Interior Ministry of the USSR. He graduated from the Military Academy of the General Staff in 2000. Shults worked in the FSB since 1992 as deputy chief of the Security Ministry's Saint Petersburg and Leningrad region department. He was deputy chief and chief of the Federal Security Service Academy in 1995-99 (ITAR-TASS, 25 Jul 00). Deputy Director, Chief of the Department for the Protection of Constitutional Order and Combating Terrorism --- ZHDANKOV, Aleksandr Ivanovich, Maj-Gen (Interfax, 10 Aug 01), (http://www.gov.ru/main/ministry/isp-vlast47.html). Deputy Director, Chief of the Department of Counterintelligence --- SYROMOLOTOV, Oleg, Col-Gen (Rossiyskaya Gazeta, 7 May 02). Deputy Director --- KOLMOGOROV, Viktor (Izvestiya, 25 Sep 01). Deputy Director --- YEZHKOV, Anatoliy (ITAR-TASS, 31 Jul 01). Deputy Director --- UGRYUMOV, German, Vice-Adm (Ekho Moskvy Radio, 29 Jan 01). Died of acute heart failure in Khankala outside Chechen capital Groznyy on 31 May 01 (ITAR-TASS, 31 May 01). Chief --- ZHDANKOV, Aleksandr Ivanovich, Maj-Gen (http://www.gov.ru/main/ministry/isp-vlast47.html). Deputy Chief --- KOZLOV, Vladimir Sergeyevich, Lt-Gen (Vek, 20 Jul 01). [Former ALPHA GROUP / DETACHMENT A (Anti-terrorist unit), Fed. Security Service] (Komsomol�skaya Pravda 26 Dec 95 p 8). Commander --- GUSEV, Aleksandr, Col (MOSCOW NEWS, No 24-25, 30 Jun-6 Jul 95, p 3). Chief --- VLASOV, Valentin Aleksandrovich, Lt-Gen (Rossiyskaya Gazeta, 25 Apr 01). Vlasov graduated from the Moscow Economic Institute [MEI]. He then worked at a scientific research institute of the Russian defense complex, where he was involved in the development of spacecraft docking systems. Later, upon the proposal of Nikolay Patrushev, he served as first deputy chief of the FSB Administration for Moscow and Moscow Oblast. During the course of his career, he has developed "purely official and respectful" relations with Vladimir Putin (Rossiyskaya Gazeta, 25 Apr 01). Refered to as "Second Department" (Postfactum Agentstvo Politicheskikh Novostey, 23 Jan 01). Deputy Director --- KOMELKOV, Aleksandr, Col (Segodnya, 9 Oct 98, pp 1-2). Komelkov while working as �deputy chief of one of the departments of the 5th Main Directorate of the KGB (work with dissidents), was forced into discharge from "the organs" in 1987 precisely because an agent accused him of engaging in such abuse [misappropriation of agent funds]. It cannot be ruled out, however, that Komelkov was simply "set up" in accordance with the reigning custom of those times. Chief --- ZOTOV, Gennadiy, Maj-Gen (RIA, 16 Oct 98). Chief --- PETRISHCHEV, Vladimir Ivanovich, Lt-Gen (Krasnaya Zvezda, 19 Dec 98, p 2). Chief --- VOLOBUYEV, Nikolay, Lt-Gen (Gazeta, 6 May 02), (http://www.gov.ru/main/ministry/isp-vlast47.html). Volobuyev graduated from the Russian FSB Academy. He has been working in counterintelligence for over 25 years, climbing all the rungs of the ladder from operations officer to head of the Counterintelligence Operations Directorate. He is married with two grown-up daughters, and claims to have a very harmonious family life (Gazeta, 6 May 02). Chief --- MURATOV, Vladimir, Maj-Gen (Segodnya, 19 Dec 00, P 1). Head --- TSARENKO, Aleksandr, Col-Gen (Nezavisimaya Gazeta, 04 Jul 00, P 1). Chief --- MOLCHANOV, Vladimir, Maj-Gen (Profil, No 13, 31 Mar 03). Chief --- ZAKHAROV, Viktor, Maj-Gen (Agentstvo voyennykh novostey, 13:52 MT, 19 Jul 00). First Deputy Chief --- SMIRNOV, Vladimir, Lieutenant General (Segodnya, 19 Dec 00, P 1). Chief --- BULAVIN, Vladimir, Lieutenant-General (Parlamentskaya Gazeta, 13 Nov 02). Chief --- SHIDLOVSKY, L., Maj-Gen (Voyennyy Vestnik Yuga Rossii, 17 Dec 01). Chief --- ZDANOVICH, Aleksandr Aleksandrovich, Lt-Gen (Trud, 28 Feb 02). Deputy Chief (���������� �������� ���������� ��� ��) --- Ignatchenko, Segey, (T���, 29 Oct 2002). Chief --- ZDANOVICH, Aleksandr Aleksandrovich, Lt-Gen (Kommersant, 10 Apr 02). Chief --- KHRISTOFOROV, Vasiliy, Maj-Gen. (Vremya-MN, 27 Feb 03). Chief --- SHISHIN, Sergey Vladimirovich, Major-General, APPOINTED Dec 02 (Gazeta, 17 Dec 02). [Successor to former Ministry of Security. Administrative apparatus of 1,500. Total personnel, including military & civilian, of 75,000. (Krasnaya Zvezda 10 Jan 94 p 1). [�Federal Security Service [FSB] Director Vladimir Putin recently is sued an order eliminating two vitally important structures -- the Economic Counterintelligence Directorate [UEK] and the Counterintellignce Support for Strategic Installations Directorate [UKROSO]. Six new directorates have been created to replace them. ��All the high-profile financial-economic cases instituted in the past few years resulted from materials supplied by these directorates. It was the UEK and the UKROSO that provided the operational accompaniment to some scandalous criminal cases (Aeroflot, Atoll, and so forth).